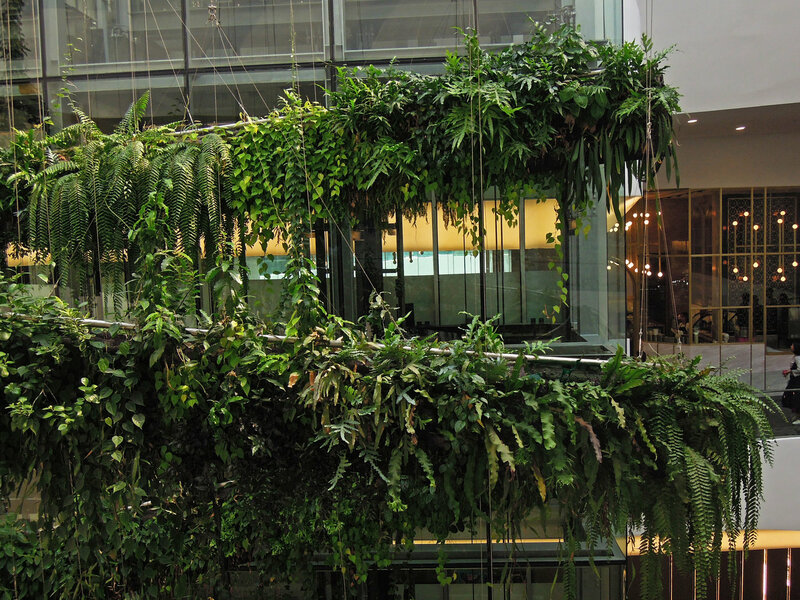 Back in February, I traveled to Cleveland to hear Patrick Blanc speak on the Science, Architecture and Design of Vertical Gardens. The Shaker Lakes Garden Club hosted the event in which Patrick spoke for a full two hours and shared hundreds of images and projects. Patrick is the person responsible for vertical gardening across the world, with the inspiration and foundation starting as a boy in love with aquariums and providing the best environment for fish. What I think is missing in a lot of main stream articles about Patrick is the fact he is a scientist first and foremost in botany and has spent a lifetime exploring the world studying and discovering new plant varieties. 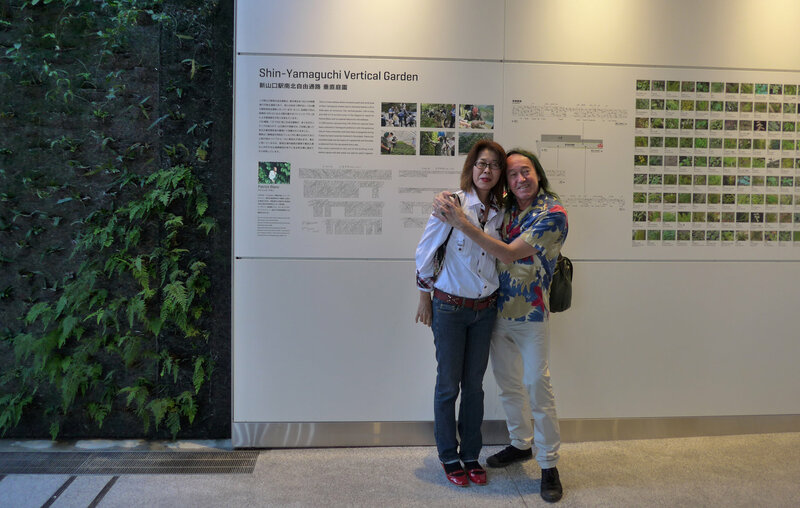 It is his vast knowledge and lifetime of passion and curiosity that as giving him the ability to be both the founder and maverick of the vertical gardening world. 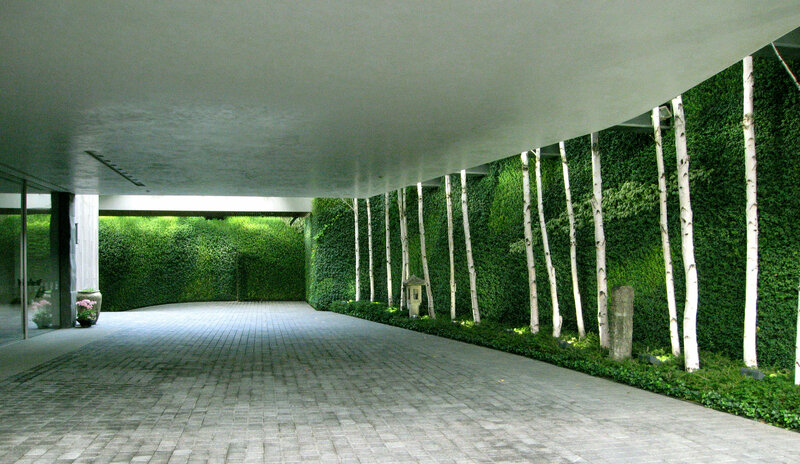 A private residence in Seoul, features green walls in a motor court that engulfs visitors and blurs the lines of the space. The birch trees are striking against the green backdrop. One of my favorite projects he has completed. When he explains the systems, it all seems so simple and straight forward, but again that because of his expansive knowledge and experience. 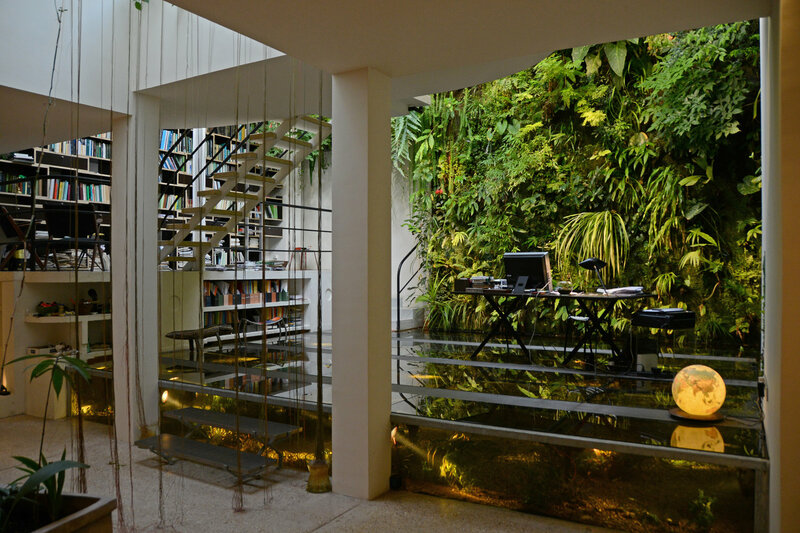 His walls can have hundreds of different plant species woven together, however each plant and placement is made based on the individual sight specifications such as direct sunlight based on surrounding structures. The irrigation systems are rigged to deliver water based on the wall placement. Indoor locations get shorter more frequent watering compared to outdoor spaces. He is also very specific in the nutrients added to the watering system, knowing the balance of the plants needing only a bit of some nutrients. Finally, maintenance should just be watching the watering and periodic trimming back if following his directions. 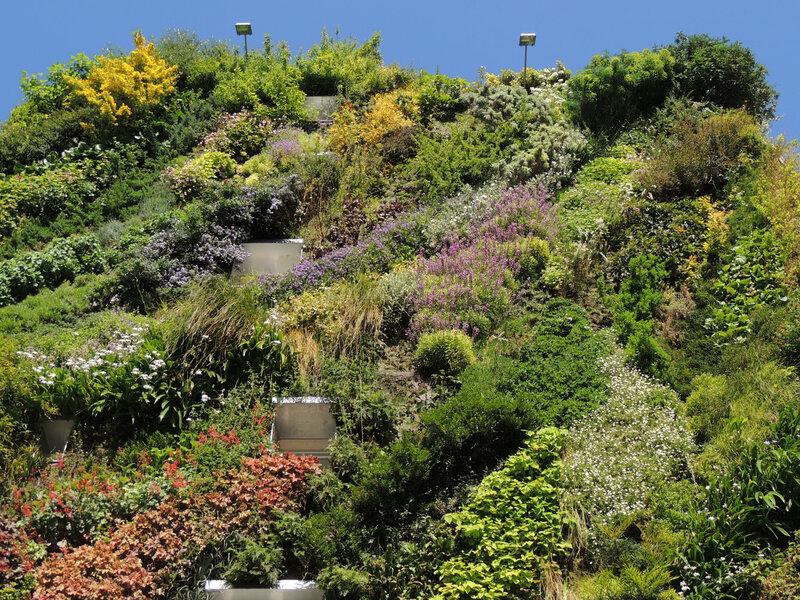 Besides his ability to put is work into such simple terms to understand the basics of the system, is his ability to constantly be pushing what and where vertical gardens can be. Here are a few projects he shared that I enjoyed the most, but his website lists so many you should really explore. 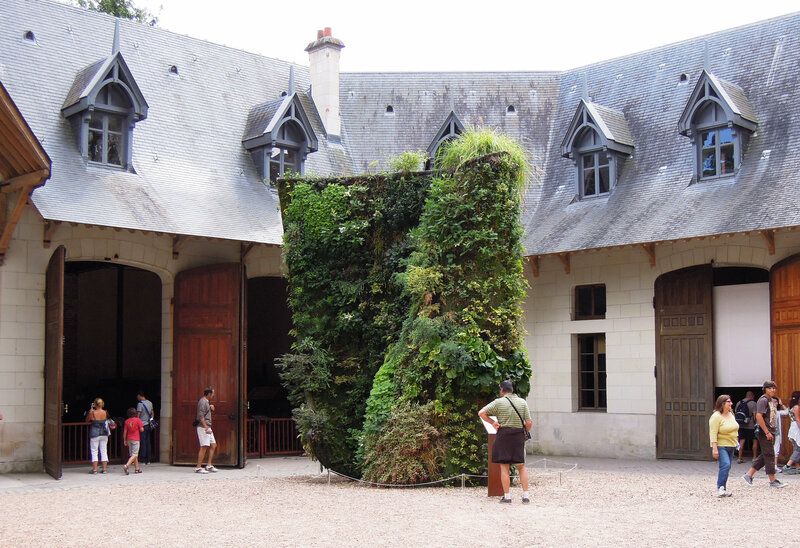 Blank walls seem to be the logical place for a vertical garden, but this project for a free-standing sculpture covered was an aha thought, you don’t need a building with a blank wall to go vertical. (More photos of the Spiral at Chaumont Sur Loire HERE). All the images on the post are from Patrick’s site, so I highly recommend you check it out and explore. A great tool is the project MAP, you can see where all the projects are located, maybe in you area during your future travels. 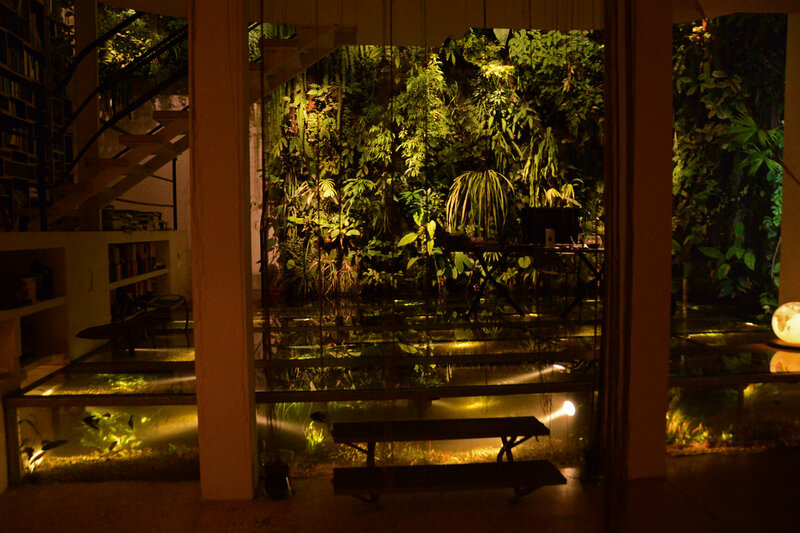 This entry was posted in Green wall, Landscape Design and tagged garden design, garden inspiration, gardening, gardens, green wall, landscape design, Patrick Blanc, rainforest chandelier, Shaker Lakes Garden Club, Shin-Yamaguchi Station, Spiral at Chaumont Sur Loire, vertical gardening by Nick. Bookmark the permalink.